Carrying out wheel alignment checks and adjustments as part of car servicing is now a must with the modern vehicles. 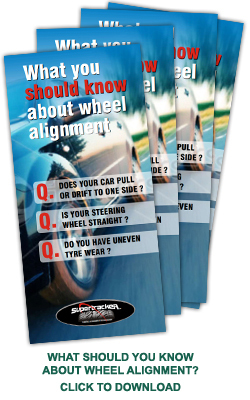 Correct wheel alignment gives optimum handling, extended tyre life and improved fuel economy. With the modern electronics in vehicle it is also essential to have the steering geometry correct as this will affect the stability programmes in the vehicle set up. The Engineer will approach each vehicle and discuss with the customer regarding load, tyre type and condition, and vehicle handling characteristics. To establish if there are any problems that may exist with the vehicle. Worn or damaged mechanical components can cause tyre wear or impact the vehicles handling. Wherever possible the engineer will attempt to identify if any components are damaged or worn, and will recommend replacement or repair prior to adjusting the wheel alignment geometry. Possible issues could be incorrect tyre pressures, incorrect tyre fitment, track rod condition, worn ball joints, worn wheel bearings, worn steering components, damaged suspension parts and possible body / chassis issues. Once the check procedures have been completed and any problems corrected the wheel alignment measurements can be taken. The readings should be analysed and compared with the specification. Make appropriate adjustments required. Check the final readings and complete all necessary paperwork.